I remember quite clearly the estate sale where I bought this book. It was tucked away in a basement alcove, and yet in beautiful, worn but immaculate condition. I was once told by a palm reader that I have 'psychic fingers'--that I can sense things through my hands. I've never felt it more clearly than when I picked up this book. This book gave me such a strong sense of calmness, of graciousness, and essential goodness. 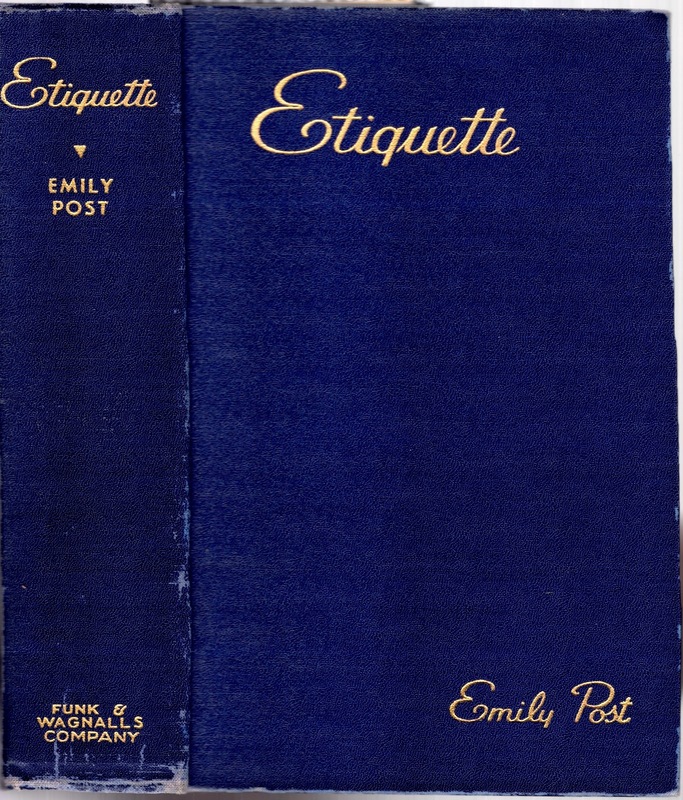 I've always treasured this book, and it started my mild obsession with collecting vintage books on etiquette, charm, and entertaining. 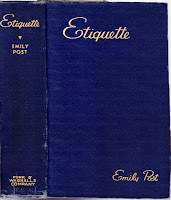 Etiquette: The Blue Book of Social Usage by Emily Post (Mrs. Price Post, according to the title page) was originally printed in 1922 and went through many, many printings before my little 1940 edition was published. The contents include a plethora of fascinating topics including At the Opera, the Theater, and Other Public Gatherings, Manners for Motorists, The Well-Appointed House, The Debutante, The Vanished Chaperon and Other Lost Conventions, Modern Exactions of Courtesy, What We Contribute to the Beauty of Living, and, of course, Flat Silver--Its Choice and Usage--Condensed Table Setting. It is hard to say why the word "etiquette" is so inevitably considered merely a synonym of the word "correct," as though it were no more than the fixed answer to a sum in arithmetic. ... I wish that those whose minds are focused on precise obedience to every precept would ask themselves instead, "What is the purpose of the rule? Does it help to make life pleasanter? Does it make the social machinery run more smoothly? Does it add to beauty? Is it essential to the code of good taste or to ethics? If it serves any of these purposes, it is a rule to be cherished; but if it serves no essential purpose, it is certainly not worth taking very seriously. Nothing is so easy for any woman to acquire as a charming bow. It is such a short and fleeting duty. Not a bit of trouble really; just to incline your head and spontaneously smile as though you though "Why, there you are! How glad I am to see you!" So charming! Should you be interested in learning more about Emily Post, and the vast empire of etiquette she founded, that continues to this very day, you may enjoy Emily Post: Daughter of the Gilded Age, Mistress of American Manners by Laura Claridge.